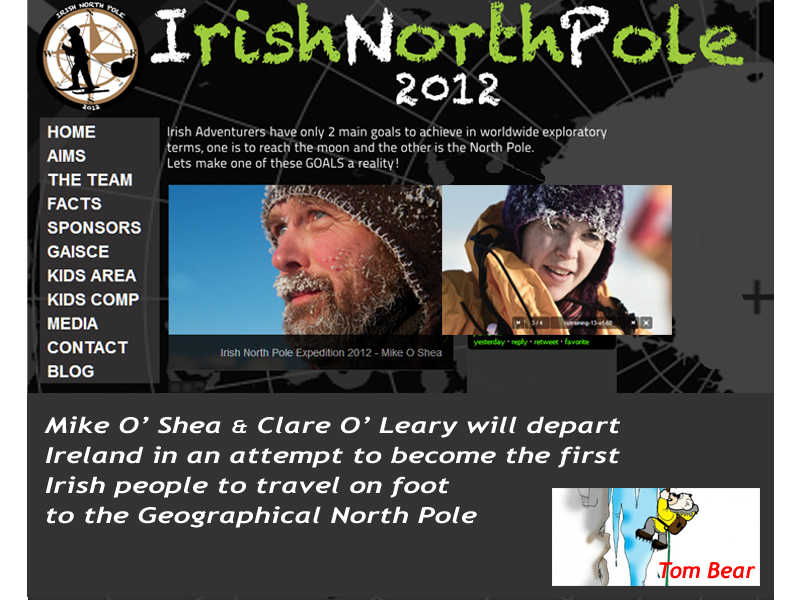 Irish adventurers Mike O' Shea and Clare O' Leary want to become the first Irish people to travel on foot to the Geographical North Pole. They have decided to depart from the classical starting point, the northern coast of Ellesmere Island, Ward Hunt. For the first two weeks, the tandem O' Shea/O' Leary will be based in Iqualit in Northern Canada, under the mentorship of famous polar guide Matty Mc Nair, who will also be acting as base camp manager during the expedition. On February 25th the team shall depart to Resolute Bay for final preparations, and hope to take the flight onto the ice on the 28/29 of February from where they will begin an almost 800 km journey through the ice pack. The trek should t ake about 50 – 60 days and they will endure daily temperatures of between -40 and -60 degrees centigrade. The harsh conditions are further added to by there only being 3 hours daylight at the start and over the first month this will extend to 24 hours of daylight, the moving ice sheet that continually splits and shifts either creating mounds of ice rubble to be climbed over or leads of open water that must be swam across. Dr Clare O' Leary. She is one of the world’s leading female adventurers and high altitude climbers with many seasons on the world’s great ranges. In recent years she has participated in a number of endurance adventures that have endorsed her position both as Ireland’s and one of the worlds greatest adventurers. Clare hopes to complete the 3 poles with this Expedition. Besides, she is the first Irish female to : climb Mt Everest (2004), climb the Seven summits (highest mountain on each Continent), Climb Ama Dablam’ in the Himalayas, ski across the Greenland iceland cap and ski to the South Pole. Mike O' Shea. Mike O’ Shea has travelled extensively throughout the world and has spent 5 summers in the European Alps and 1 winter, primarily in the Chamonix area, adding routes like the Frendo Spur and Gervasutti Pillar to his credit. Internationally he has participated in a range of expeditions in Africa (Kilimanjaro & Mt Kenya), Nepal (Island Peak & Ama Dablam), Pakistan (K2), New Zealand (Mt Cook) ; he has also travelled to a wide range of countries on trips to far flung areas including Irian Jaya. O'Shea is a keen skier also and has been visiting the Alps, Canada & America over the last 20 years as well as being a very experienced and acclaimed Paraglider/Paramotorist. Tom Bear. This adventure small bear-mascotte is a way to teach children (and adults) the geography of the world. Through the adventures and discoveries of the bear, as relayed in his journal, e-mails, photographs and video coverage, children can learn about the trials and tribulations of participating in an adventure to the North Pole.